Yes, the end is indeed nigh…but not for the world. No, an even sadder end has been reached; the conclusion to Edgar Wright’s Three Flavours Cornetto trilogy, with the release of The World’s End. However, Wright, Pegg and Frost go out in style, with a film that takes brave turns away from what worked previously, and exudes even greater style, pathos and personality. The World’s End follows the tale of Gary King, a man who was a leader with the world ahead of him when he was young…but his life never hit the heights of his hedonistic youth, encapsulated in his most treasured memory: his, and his four best friends, attempt to conquer Newton Haven’s golden mile, an epic pub crawl comprising of 12 pubs, culminating with the eponymous The World’s End. However, that fateful night in 1990, they never made it all the way…and now, 23 years later, Gary is set on righting that wrong, by gathering his estranged friends and taking on the golden mile one more time. However, upon returning to their home town, they soon realise all is not right, and that more than just their friendship will be on line…but the fate of humanity. Perhaps one of the most defining qualities of this film is the sheer nostalgia of early nineties culture, something that is obviously very personal to Wright and Pegg. 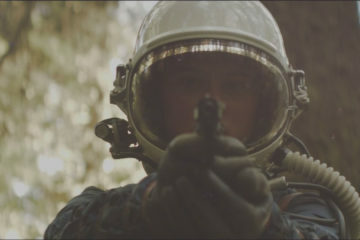 King’s memories are scored with the likes of Primal Scream and the Stone Roses heightening the soft focus images of idyllic youth; and once the film shifts to the present and the apocalyptic threat takes hold, it feels like the very energy and youthful verve that the film equates with this era and sound drives the film on as much as the characterisation and visuals. The casting is, like the previous films of the trilogy, absolutely superb. Bringing together some of the cream of British acting talent in the form of Paddy Considine, Eddie Marsden and Martin Freeman, alongside the essential Simon Pegg and Nick Frost, creates a central cast that blends together with real chemistry and form a relationship that feels genuine and honest; with the sly digs, intimate jokes and sense of a bond against all odds that the audience can relate to and believe in. Simon Pegg in particular gives his best performance of the series as the complex and immature Gary King. 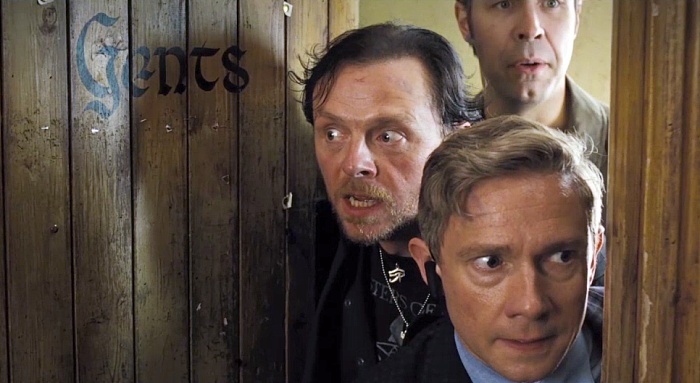 The World’s End is the darkest film in the series, centred on a man who is an addict, egotistical and at times recklessly selfish. And yet, Pegg brings tremendous depth and pathos to the character, taking him on a journey that absolutely strips the bravado of the man down from the ‘fearless leader’ of the gang, into a troubled soul who could never live up to his own expectations, and lost everything he loved in the process. His relationship with Nick Frost’s character, Andy, proves to be an interesting departure from the previous films in the series, which centred on the bromance between the two men as a driving emotional force. Here, Andy is in fact the most unforgiving of Gary’s friends, and is offended by his vices and attitude, spending most of the film rejecting their friendship due to events in the past. By focusing away from just the two men, and upon the larger group of all five men, the film is stronger for it, and allows the narrative to breathe and strengthen the characterisation. Where Shaun of the Dead was inspired by the classic zombie films of Romero and Fulci, and Hot Fuzz was an ode to the Hollywood action film ala Michael Bay, The World’s End channels the paranoiac science fiction horror films of the 1950’s, in particular Invasion of the Body Snatchers and The Village of the Damned, channelling the conspiracy and sense of overwhelming odds that give those films such thrills and suspense. However, the film still retains the trademark delicate balance between homage and playful parody that made Shaun of the Dead and Hot Fuzz such heartfelt and hilarious successes, managing to imbue The World’s End with genuine tension and humour in a distinctive affective way. One particular element that illustrates the evolution of the series, and particularly Edgar Wright as a director, is the glossy action and the increased presence of choreographed fights. These scenes are filled with such dynamic energy in perfect harmony with the humour and quick wit of this filmmaker, as illustrated as King attempts to still finish his pint while fighting endless enemies, all captured in spinning pirouettes that would even bamboozle John Woo. This dynamism is juxtaposed with an imposing sense of claustrophobic environments, as this slice of small town England is reduced into a nightmare of intense interiors, and the dark streets where our heroes are closed in on by the sinister forces at work, the brilliant blue lights that shoot from their face being both sinister and stunning to behold as they hunt their prey. With the film being the finale to the trilogy, Wright layers the film with reference upon reference to the previous films; from slight cameos to something as simple as the jingle of a fruit machine from Shaun of the Dead, the sheer level of fan service and attention to detail is impressive and endearing; another personal touch that elevates the film. Some may lament the loss of the more rough around the edges, less flashy quality of Shaun of the Dead in favour of the stylised action and effects, but Edgar Wright’s visual expression has always been defined by the kinetic, focused on the relentless movement and bursts of action, even in his own technique (the motif of the crash zoom Wright repeats perhaps articulating this more than any other cinematic quality in his cinema), and his direction of The World’s End only solidifies his reputation as an exciting and distinctive British filmmaker, who has an enviable international appeal for his stylistic flexibility. 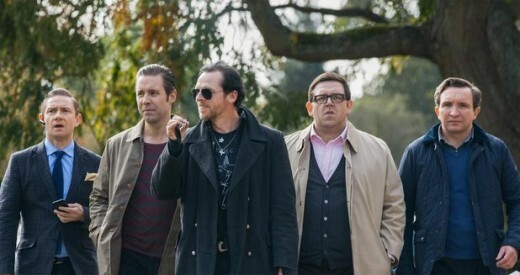 The World’s End is a fitting conclusion to a modern cult trilogy that has defined a generation. Epic and yet personal, the boys unleash a very British apocalypse that is visually dynamic, emotionally rich and joyously entertaining.